This is just a little too fun to resist blogging about. Here’s the profile cloud for my followers on Twitter. Now I’ll need to figure out what to make of it. 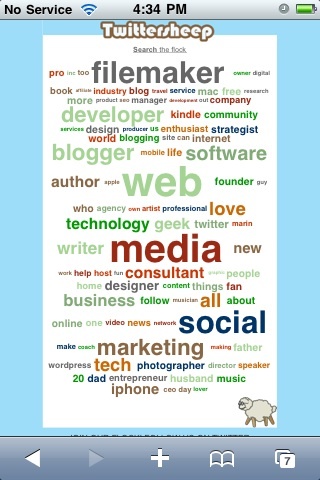 If you would like your own personal follower profile cloud, just go to twittersheep.com and enter your Twitter name into the prompt. No registration required. I found this little gem of a resource in The Twitter Book. Insightful, entertaining and a very quick read by the way! Heads up friends. We re-engineered the tokerud.com website so that it is based on WordPress. I’ve been blogging since 2003 and it only seemed right that we underpin this website with blog smarts. I will put in a FileMaker tab and other niceties shortly. I’m really liking the look as is but we are making small changes with custom CSS and with the extra dashboard options panels that the Thesis theme provides. These are early days at Tokerud Blog so you may see a few rough edges at first. I’m loving WordPress and this cool Thesis Theme which I’m putting through its paces. So that the blog will reflect our history, we’ll be re-posting some of our older material to our blog archives to back fill. I’ve written a series of 5 blog posts on my Tech Ronin blog called Dipping a Toe Into WordPress if you would like to know a bit more about my process going from a static website to a WordPress-driven site. Don’t forget to follow me on twitter if you are so inclined. I’m tokerud there. A lot of my blogging is micro-blogging on twitter these days. Is Apple OK or Not?